What should we be looking for when our home construction begins? Here are six home inspection points costly to fix later. Many builders are honest, but errors are likely in any construction project. Reader Question: We are nearing a decision on having a new home constructed. Not having built a home, what should we be looking for once the contract is signed, and construction begins? Justin and Allison B.
Monty’s Answer: The assumption in answering your question will be that you have engaged in an exercise described in this article https://dearmonty.com/tips-for-selecting-a-builder/. Your experience may not be identical, but similar. This qualification is necessary because there are many moving parts in custom home construction and your contract with the builder is the roadmap to completion; with no detours. For example, a reader recently asked a question in a dispute over a window. In the process of answering their question, it turned out that the buyer signed a contract without a house plan. Most builders want floor plans, elevation drawings, and specifications in the contract to avoid such a situation. Change orders made during construction typically add unnecessary costs. Some eager customers show up almost daily toward the end of the day to watch their new home come to life. Others may rarely visit the construction site. I recall a client building a home in a cross-country move, which never set foot in their new home until they took occupancy. The two most important points to keep in mind is there are also municipal inspectors that visit periodically to ensure code compliance. The code and inspector experience and diligence can vary by state and municipality. Also, caution should be taken when moving around a construction site as accidents can happen. Anything from wet concrete to open stairwells can create a do-over or injury, so proceed with caution. Check the proposed elevation of the top of the poured foundation before it is installed to make certain that the structure is set high enough for proper drainage away from the house. Lot contours, soil type, and surrounding topography can impact the decision of building elevation. After the footings and foundation are in place, the next step is framing the home up with floor plates, wall studs, headers and roof trusses. Verify the lumber grades and species match the specifications before installing the wood. When they finish the framing, take a walk through (bring a tape measure) to check the room count, the rough dimensions, and the placement of headers for window and door openings. 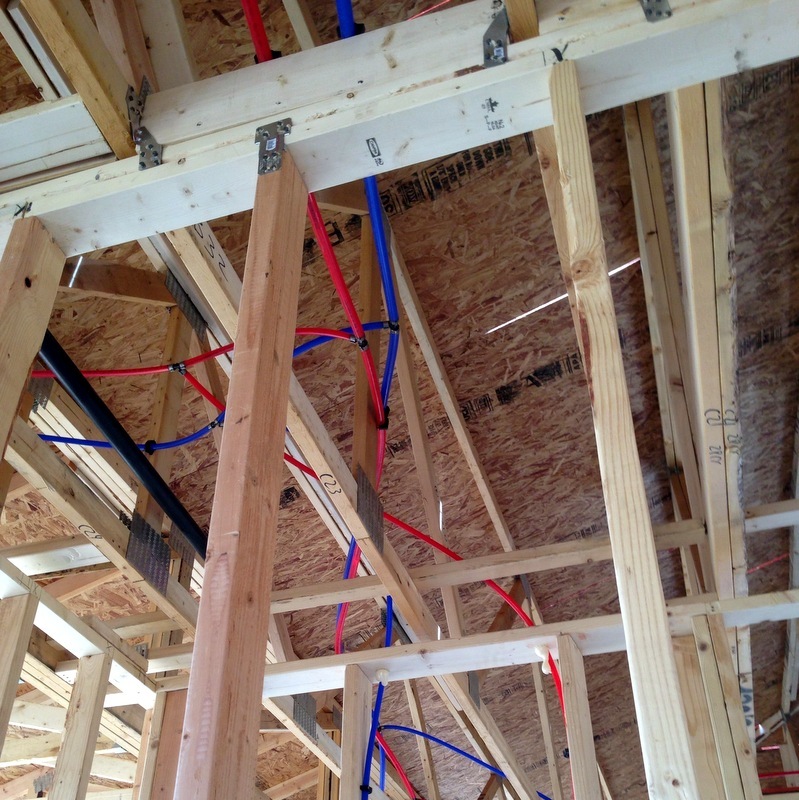 The OSB board or plywood sheeting is then installed on the exterior sides and over the roof trusses. Weather resistant barriers are installed over the sheathing to add an extra layer of protection from moisture penetration and for breathability. Verify that they are using the specified material. Here is a link to a white paper about the barriers for your information at http://www.benjaminobdyke.com/uploads/resources/Understanding_Housewrap.pdf. The installation of the roof material is a significant milestone in the process. You want to be there when the shingles are delivered to check on-site if the style, color, and grade are as expected. For example, certain shingles come in different grades rated on life expectancy. If you are paying for a 50-year roof make certain they did not deliver a 20-year roof to the site. Rough-in work for the HVAC, electrical and plumbing is the next phase. The subcontractors run plumbing and electrical through the interior walls, ceilings, and floors. Tubs and shower units, as well as any extra support or bracing for specialty extras, are installed. Ductwork and HVAC vent piping for the heating, ventilation, and air-conditioning (HVAC) system are installed. Make sure the vent pipes are coming through the roof on the backside. From the electric panel, the electrician runs wire to junction boxes for outlets, lights, and light switches. It is common to include wiring for telephones, cable TV, and music systems. Now you can check the wiring to see if all these components are in the correct position. This next step places insulation in the walls and ceilings. Here you can verify the insulation is what you ordered. Many builders apply sheetrock (gypsum board) to the interior ceilings and one side of interior walls when insulating to increase efficiency. Walk through the house to check the subcontractor overlooked no sections. Because the remaining components are visible, spotting discrepancies become second nature by this time. Follow the above inspection routine on the plastering or drywall, painting, floor coverings, cabinets, and vanities. If you do not have the time or the inclination to take these steps as outlined, consider engaging a home inspector when the home is completed, but before you settle up with the builder. You are almost home.